I’m in the market for a new Mac. If you’ve seen the svnmark times, you’ll see that my current PowerBook G4 1.33Ghz is already an order of magnitude slower than the current Intel models. The top of the lines are the Mac Pros, but I wonder if they’re a bit too much. Plus I don’t have an external LCD. It has Firewire 800 which is critical for fast data transfer for audio/video editing. It’s got Core 2 Duo, which is not quite a Xeon, but its available in up to 2.33Ghz and the Core 2 Duo is 10% faster than the original Core Duo. Because of that, I estimate that the Core 2 Duo 2Ghz will get 1:48 on svnmark, the 2.16Ghz will get 1:40 and the 2.33Ghz will get 1:30. You can upgrade it all the way up to 3GB, which is 1GB more than any other Intel Mac aside from the Mac Pro. Unfortunately, 2GB SO-DIMMs are very pricey, but then again so is the memory for the Mac Pro. I wonder why Cinema 23-inch Display and this 24-inch iMac have the same resolutions. No cube reborn, I suspect. http://samuraicoder.net/no_cube_planned . I’d suggest you check iMac at hands because iMac’s head is very heavy. As a result, the display is trembling on my desk. Aside from that, it’s a perfect semi-pro machine. Mac Pro doesn’t come with iSight camera! 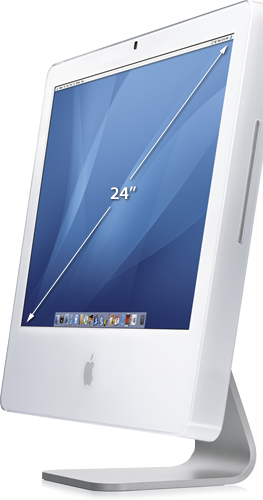 I find it interesting their is no discount on the 24-inch iMac in the ADC store. Takaaki: The display is trembling? That doesn’t sound good. Mike: Yes that’s weird that there’s no discount. I checked last week when it first came out and the 24″ was $1799 on the ADC Store, which is the standard 10% that Apple gives on the consumer-level hardware (vs the 20% it gives on the pro-level.) I think that must be a temporary mistake.